Frank Owen Gehry (born Ephraim Owen Goldberg; February 28, 1929) is a Canadian-American Pritzker Prize-winning architect based in Los Angeles, California. His buildings, including his private residence, have become tourist attractions. Many museums, companies, and cities seek Gehry's services as a badge of distinction, beyond the product he delivers. His best-known works include the titanium-covered Guggenheim Museum in Bilbao, Spanish Basque Country, Walt Disney Concert Hall in downtown Los Angeles, Experience Music Project in Seattle, Weisman Art Museum in Minneapolis, Dancing House in Prague, Czech Republic and the MARTa Museum in Herford, Germany. However, it was his private residence in Santa Monica, California, which jump-started his career, lifting it from the status of "paper architecture," a phenomenon that many famous architects have experienced in their formative decades through experimentation almost exclusively on paper before receiving their first major commission in later years. Much of Gehry's work falls within the style of Deconstructivism. Deconstructivism, also known as DeCon Architecture, is often referred to as post-structuralist in nature for its ability to go beyond current modalities of structural definition. In architecture, its application tends to depart from modernism in its inherent criticism of culturally inherited givens such as societal goals and functional necessity. Because of this, unlike early modernist structures, DeCon structures are not required to reflect specific social or universal ideas, such as speed or universality of form, and they do not reflect a belief that form follows function. Gehry's own Santa Monica residence is a commonly cited example of deconstructivist architecture, as it was so drastically divorced from its original context, and, in such a manner, as to subvert its original spatial intention. Gehry is sometimes associated with what is known as the "Los Angeles School," or the "Santa Monica School" of architecture. The appropriateness of this designation and the existence of such a school, however, remains controversial due to the lack of a unifying philosophy or theory. This designation stems from the Los Angeles area's producing a group of the most influential postmodern architects, including such notable Gehry contemporaries as Eric Owen Moss and Pritzker Prize-winner Thom Mayne of Morphosis, as well as the famous schools of architecture at the Southern California Institute of Architecture (co-founded by Mayne), UCLA, and USC where Gehry is a member of the Board of Directors. Gehry’s style at times seems unfinished or even crude, but his work is consistent with the California ‘funk’ art movement in the 1960s and early 1970s, which featured the use of inexpensive found objects and non-traditional media such as clay to make serious art. Gehry has been called "the apostle of chain-link fencing and corrugated metal siding". However, a retrospective exhibit at New Yorks's Whitney Museum in 1988 revealed that he is also a sophisticated classical artist, who knows European art history and contemporary sculpture and painting. Gehry was elected to the College of Fellows of the American Institute of Architects (AIA) in 1974, and he has received many national, regional, and local AIA awards, including AIA Los Angeles Chapter Gold Medal. He presently serves on the steering committee of the Aga Khan Award for Architecture. Gehry was awarded the Pritzker Architecture Prize at the Tōdai-ji Buddhist Temple in 1989. The Pritzker Prize serves to honor a living architect whose built work demonstrates a combination of those qualities of talent, vision, and commitment, which has produced consistent and significant contributions to humanity and the built environment through the art of architecture. Gehry is a Distinguished Professor of Architecture at Columbia University and also teaches at the Yale School of Architecture. He has received honorary doctoral degrees from Occidental College, Whittier College, the Southern California Institute of Architecture, the University of Toronto, the California College of Arts and Crafts, the Technical University of Nova Scotia, the Rhode Island School of Design, the California Institute of the Arts, and the Otis Art Institute at the Parsons School of Design. In 1982 and 1989, he held the Charlotte Davenport Professorship in Architecture at Yale University. In 1984, he held the Eliot Noyes Chair at Harvard University. Gehry has gained a reputation for not taking the budgets of his clients seriously. Complex and innovative designs like Gehry's typically go over budget. Sydney Opera House, which has been compared with the Guggenheim Museum Bilbao in terms of architectural innovation, had a cost overrun of 1,400 percent. It was therefore duly noted when the Guggenheim Bilbao was constructed on time and budget. In an interview in Harvard Design Magazine Gehry explained how he did it. First, he ensured that what he calls the "organization of the artist" prevailed during construction, in order to prevent political and business interests from interfering with the design. Second, he made sure he had a detailed and realistic cost estimate before proceeding. Third, he used CATIA (Computer-Aided Three-dimensional Interactive Application) and close collaboration with the individual building trades to control costs during construction. However, not all of Gehry's projects have gone smoothly. The Walt Disney Concert Hall in Downtown Los Angeles resulted in over 10,000 RFIs (request for information) and was $174 Million over budget. Furthermore, there was a dispute which ended with a $17.8 million settlement. Gehry is considered a modern architectural icon and celebrity, a major "Starchitect" — a neologism describing the phenomenon of architects attaining a sort of celebrity status. The term usually refers to architects known for dramatic, influential designs that often achieve fame and notoriety through their spectacular effect. Other notable celebrity architects include Jean Nouvel, Zaha Hadid, Thom Mayne, Steven Holl, Rem Koolhaas, and Norman Foster. Gehry came to the attention of the public in 1972 with his "Easy Edges" cardboard furniture. He has appeared in Apple's black and white "Think Different" pictorial ad campaign that associates offbeat but revered figures with Apple's design philosophy. He even once appeared as himself in The Simpsons in the episode "The Seven-Beer Snitch", where he parodied himself by intimating that his ideas are derived by looking at a crumpled paper ball. He also voiced himself on the TV show Arthur, where he helped Arthur and his friends design a new treehouse. Steve Sample, President of the University of Southern California, told Gehry that, "...After George Lucas, you are our most prominent graduate." 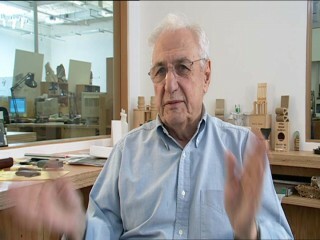 In 2005, veteran film director Sydney Pollack, a friend of Gehry's, made the documentary Sketches of Frank Gehry with appreciative comments by Philip Johnson, Ed Ruscha, Julian Schnabel, and Dennis Hopper, and critical ones by Hal Foster supplementing dialogue between Gehry and Pollack about their work in two collaborative art forms with considerable commercial constraints and photography of some buildings Gehry designed. It was released on DVD by Sony Pictures Home Entertainment on August 22, 2006, together with an interview of Sydney Pollack by fellow director Alexander Payne and some audience questions following the premiere of the film. Gehry is very much inspired by fish. Not only do they appear in his buildings, he created a line of jewelry, household items, and sculptures based on this motif. "It was by accident I got into the fish image", claimed Gehry. One thing that sparked his interest in fish was the fact that his colleagues are recreating Greek temples. He said, "Three hundred million years before man was fish....if you gotta go back, and you're insecure about going forward...go back three hundred million years ago. Why are you stopping at the Greeks? So I started drawing fish in my sketchbook, and then I started to realize that there was something in it". Standing Glass Fish is just one of many works featuring fish which Gehry has created. The gigantic fish is made of glass plates and silicone, with the internal supporting structure of wood and steel clearly visible. It soars above a reflecting pool in a glass building built especially for it, in the Minneapolis Sculpture Garden. Another huge Gehry fish sculpture dominates a public garden in front of the Fishdance Restaurant in Kobe, Japan. In addition to architecture, Gehry has made a line of furniture, jewelry, various household items, sculptures, and even a glass bottle for Wyborowa Vodka. His first line of furniture, produced from 1969–1973, was called "Easy Edges", constructed out of cardboard. Another line of furniture released in the spring of 1992 is "Bentwood Furniture". Each piece is named after a different hockey term. He was first introduced to making furniture in 1954 while serving in the U.S. Army, where he designed furniture for the enlisted soldiers. Gehry claims that making furniture is his "quick fix". This list of Frank Gehry buildings categorizes the work of the Pritzker Prize-winning architect. His buildings, including his private residence, have become tourist attractions. Many museums, companies, and cities seek Gehry's services as a badge of distinction, beyond the product he delivers. View the full website biography of Gehry Frank.